Mr. Paul Scarrott who is quite short and his wife Jackie, who has Spina Bifida and is wheelchair bound had difficulties with their kitchen units being too high and out of reach. 2 years ago their OT put in a recommendation to the council and they had various units in their kitchen replaced to allow them easier access. 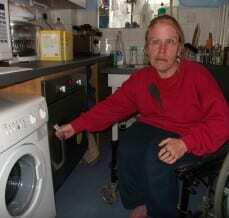 “Having the kitchen adapted has helped us a lot. Now, with the rise and fall hobs we can do our own cooking. Before I also couldn’t access the oven, it was really high. Now having it on a lower level helps loads”.